For Phone Orders Call (619) 688-0717! We’ve found exactly which items are our favorites over the years. The meat plate, which comes with chicken, beef, kofta, salad, hummus, and a pita, is outstanding. It’s like $12 and probably enough to feed two people, honestly. So freaking good. The chicken is so tender that it falls apart. The manakeesh ultimate supreme wrap will give you a mouthful of olives, labneh, za’atar, mint leaves, and more delicious beef. This wrap is sizeable and almost too much for me to eat myself. One time I drove from college in irvine on a Sunday with a friend just to quell a craving for Mama’s. Then we went to pick strawberries on the way back. Best meal I’ve had since being in San Diego. Bursting with flavor. Chicken was off the charts – succulent and tender. Owner gave us free pistachio baklava and it was delicious. OMG I’ve been coming here for more than 7 years now to just eat soujook pie with cheese and tomatoes, but today somehow I tried the grape leaves and it’s sooo delicious. Wow. Great to find few of these Middle Eastern restaurants which won’t disappoint you and Mama’s is one of them. Called in five minutes before they were closing as we were racing over there to place our order. They stayed open to wait for us, which was extremely nice of them, and got our special order right. I had super garlicky breath the next day from my garlic chicken, which for most people would be a turn off but that just made me like this place even more, because you know they’re using the real thing in that paste. And I don’t know if it’s the garlic or the wrap in general, but there are healing powers laced in their food, because my husband recovered from his cold by the next day. Better than medicine! We tried this place because it was within walking distance of our hotel. There were many choices for restaurants and we struck gold. The food was fabulous, the service was great, the portions were generous, and the price was right. We ordered our meal to go, but it has a quaint small covered patio that is a fabulous place to dine. We enjoyed it so much, we came back the next evening for more. We tried several items on the menu…all delicious! If we are ever back this way, we will come back to Mama’s! This is in my top 5 of culinary experiences in my life! Real talk. I’ve been very fortunate to be able to experience some great food in my life and Mama’s is one of my top favorites. I’m still in shock how such sophisticated flavors are coming out of this little place and how it’s still somewhat under the radar? The menu is outstanding. I want it all. Decided to play it middle field and get the chicken and beef sharwama that comes with rice, salad, hummus and bread. I also get water and their large Arabic coffee. Side note: Arabic coffee is coffee from the heavens. It’s my all time favorite and it’s a very special treat when I can get it done right. Mama’s is outstanding! Chicken shawarma wrap is delicious and portion is very large for the price you pay! Make sure to get the garlic paste & hot sauce as well. 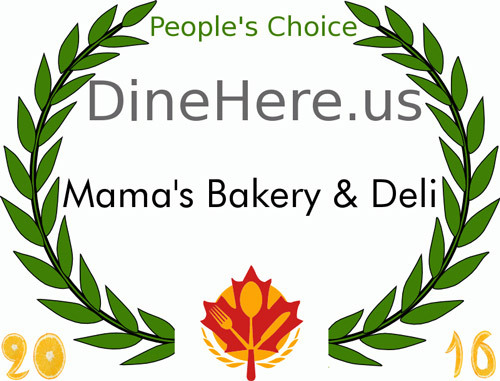 Mama’s closes fairly early, so just make sure to order on time so that you’re not disappointed. I have nothing but positive things to say about this place! I went with 3 other people and we all loved it. I got the beef kafka and my friends got the meat combo. With my plate, I got hummus and falafels as well as salad. Everything was delicious. The price was right and they allowed us to bring in our own beer since they don’t sell it. My friends live in Encinitas and want to come back just for the food! If you’re in the North Park area or near Hillcrest, this is a great spot for Lebanese food. I forgot to mention their baklawa. AWESOME! The prices are amazingly cheap and the food is always good. So I had what everyone recommended was the garlic chicken wrap. It was delicious, but you have to love garlic to love this. Not something you want to eat if planning on talking to people after tho. The portion was big, didn’t finish it and loved the pickle inside, gives a little different take on a wrap. I do want to go back and try some other food, very happy for this little gem. Mama’s Deli is amazing! It’s not fast food, so don’t go in when your on a rush (made this mistake once on my lunch break), but the fresh baked breads, meats and sauces are all to die for. The Manaeesh Ultimate is fantastic – fresh herbs, yogurt sauce and salty olives all on a homemade wrap. Yum! Ambiance is nothing to write home about, but Mama’s is perfect for a casual lunch or dinner. Call (619) 688-0717 to Phone-in Your Order Now! Mama's Bakery & Lebanese Deli © 2019. All Rights Reserved.